WHEB Asset Management is a UK based fund manager at the forefront of the growing movement in Impact Investing, they are also leaders in measuring the impact associated with their investments. 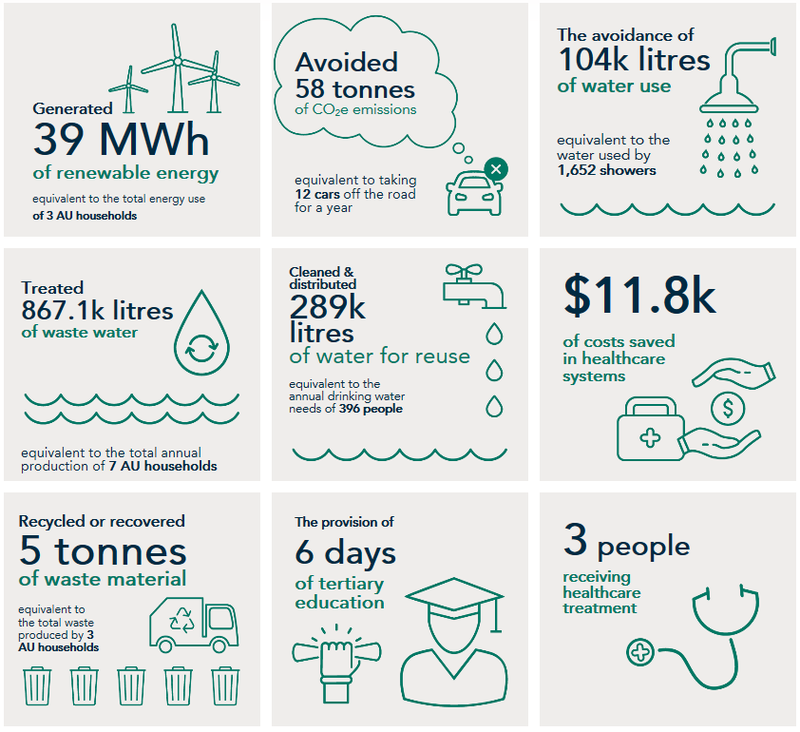 For example, if you invested $100,000 with WHEB over 2017 you would have avoided the CO2 emissions created by 12 cars, generated enough renewable energy to power 3 households, recycled 5 tonnes of waste material and generated a return on your capital. WHEB believe that investing in companies that make the world a better place is a smarter way to allocate capital. The investment process takes a long-term view so when Seb Beloe, Partner and Head of Research at WHEB, the investment manager of the Pengana WHEB Sustainable Impact Fund, recently travelled through Sydney we took the opportunity to ask him about the big opportunities he is seeing and the companies they’re backing. My background is an environmentalist. I have spent all my career working on sustainability issues. The first ten years was as a management consultant working for a company called Sustainability. The last ten years has been in investment. I have been working on sustainability all my life, but investment specifically for ten years. The point of what we are doing is investing in companies who are delivering a positive impact on society. Every time one of these companies sells another unit of product, the world gets a little bit better. It gets a bit cleaner, it gets a bit healthier, it gets a bit safer. That is what we are focused on. I can't imagine doing a better job really. Of course, revenue growth isn't the same as profitability. You can have a business that is growing revenues very impressively but has not been able to deliver a profit. The solar industries have become a classic example of that. The wonderful gift the solar industry has given society are very cheap solar panels. However, they have never made any money. What investing in this theme gives us is growth. The next step is to find high-quality businesses that can turn that growth into cash for our investors. What is most important is finding businesses that have this long-term secular growth story and are of high enough quality to turn that into cash and positive returns and compound over seven years. Whether we get the evaluation precisely right today, doesn't matter that much so long as we are not massively overpaying. If we get the quality right and the market attractiveness right then we will see healthy returns over seven years. "It has to deliver returns, that is the most important thing. It just so happens that we do that through this positive impact approach". It is an extraordinary development in terms of how quickly these things have become so cheap. That doesn't necessarily mean you can make money. With solar, because it is essentially a commodity now, the solar panel and the barriers to entry to that industry are very low. It's not difficult to make a solar panel. It does mean that it's been very difficult for them to make any money. We don't have any investments in solar at the moment. We have had, and we lost money. We learned our lesson and decided it's not an area that we want to get back into. At least for the time being. Wind is a bit different. Wind is a much more mature sector. It has consolidated to have much bigger barriers to entry. It's not easy to make a big wind turbine generator. They're able to control the market better. They have a bit more pricing power. That's the sector that we invest in. We hold a company called Siemens Gamesa (BME: SGRE) which is the world's second or third largest wind turbine manufacturer. We also own a company called TPI Composites (NASDAQ: TPIC) which make the wind turbine blades. As this industry has matured, the turbine manufacturers have worked out that it’s a non-core aspect they can outsource to a third party who can do it much more efficiently than they can. They see some healthy returns in that sector now and good growth as well. It's been a good investment. There aren’t actually many opportunities in the space, other than Tesla. We wouldn't invest in any of the other car manufacturers because the revenues they currently get from EV's or even hybrids are too small to drive the share price. Tesla, of course, has 100% EV's so we could invest in them. However, the valuation is not attractive. Instead, we invest in the companies that are making the various components and subcomponents and systems that go into an EV or a hybrid. We invest in companies like Littelfuse (NASDAQ: LFUS) that make the fuses that go into EV's. The companies that make the wire connections, the harnesses that are used, the sensors that go into EV's as well. "The car industry’s over the next ten years is really going to experience the biggest change that it's really ever experienced." Not just because of EV's, but also because of automation as well. They not only have to negotiate this shift from internal combustion to electric, which is big enough because it requires them to completely change their manufacturing capacity but automation will also change the business model. It will get to a point where your car is entirely automated (probably 10 years from now). People won't own their car anymore. You will just buy transporter service. The car will turn up and it will take your kids off to school. It will do whatever you want. That will be an extraordinary change for that industry. There are all sorts of things I could talk about. I've talked about EV's already which is a five to ten-year story. We haven't talked about things like plastics and plastic pollution which is becoming a massive issue in the media. Of course, we care about plastics in the ocean, but that plastic is getting into everything. If you eat sea salt, part of that sea salt is actually plastic. There's plastic in all of us now. It's a massive problem. Not just from a recreational point of view but a conservation point of view. From a health point of view, this is a real issue. That's kind of exploded in the last 12 months. Plastic packaging is really the problem where you're using plastic for just a few seconds and then you throw it away. it's completely biodegradable so there is no build up in the natural environment. We invest in businesses that use 80 per cent recycled materials as part of this closed loop. It's a much more sustainable packaging material. People are now moving to cardboard and moving out of plastics. Increasingly, I am finding these straws that are made of cardboard now. It's kind of incredible. "What we're investing in is already seeing some interest in revenue because of people trying to move away from plastic." We have one investment in Australia which is CSL Limited (ASX: CSL). We've held it for seven years. It's been a great investment. It's a great company. It's our health theme, obviously. We have also looked at some other businesses. Brambles (ASX: BXB) is another business that we've looked at. Basically, they make pallets. Wooden pallets. They are reused, it's better for the economy. There are so many good companies down here that we do look at. The only one we currently have is CSL. It’s really important that you don't see this as a sub-optimal way of investing. People assume that to have a positive social impact, you’re going to have to compromise elsewhere. That's not at all how we see it. We can deliver superior returns because we are investing in this way. These are companies that are growing their revenues on an annualised basis of 10% per year for the last seven years. If you look at the oil and gas sector they have seen revenue contraction by 6% per year for the last seven years. We are seeing that with revenue growth over that last ten years. It's because we invest this way that we can deliver superior returns. Positive-impact investing is not a compromise. It takes us to more attractive companies that are seeing growth.